Personalise your home with this fantastic range of VELUX roof window blinds. 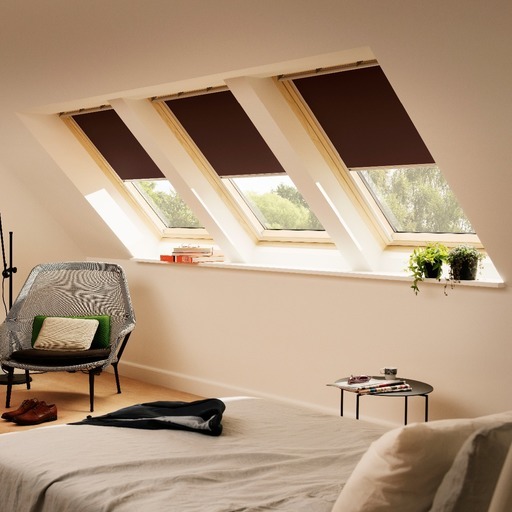 Whether you require blackout blinds for a master-bedroom or venetian blinds for privacy in a home office, The Loft Access Company can supply and install the perfect blinds for your VELUX skylight. Here are just a small number of the options available. Pleated roof window blinds offer privacy and sunscreening as well as decorative elegance. 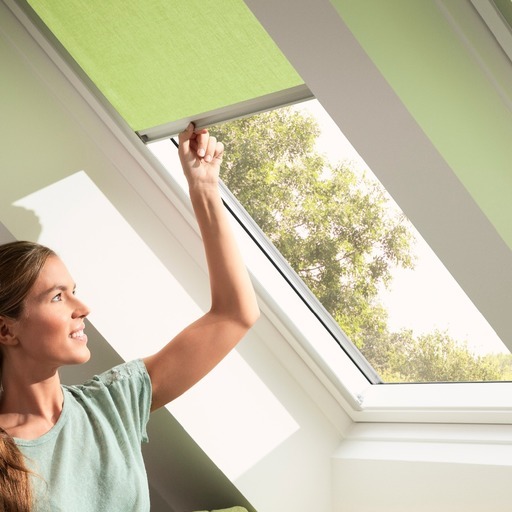 With the ability to retain their shape even with regular use, these VELUX Roman Blinds are available for all VELUX roof window in a range of colours. 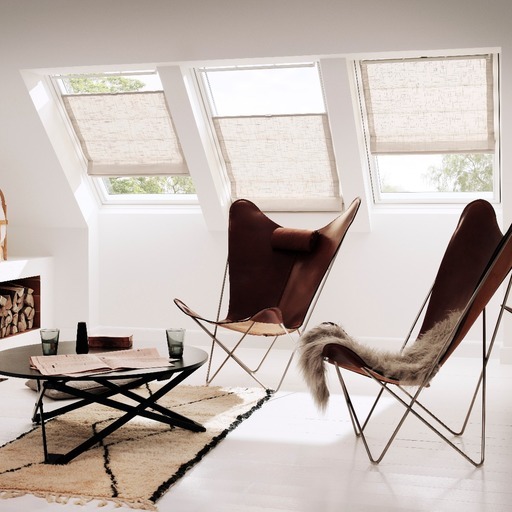 VELUX Roller Blinds are the most cost-effective blind option. Available in a wide range of colours, patterns and themes (Star Wars, Disney), they can be positioned at various points on the window for precision control. Venetian blinds are ideal for bathrooms and kitchens as they are easy to clean, and can control both the amount and direction of heat and light. This classic roof window blind combines elegance with practical simplicity. 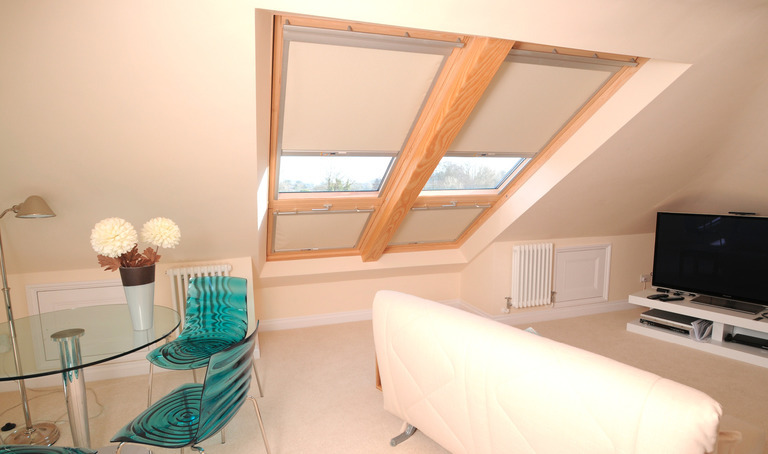 Blackout roof window blinds are a good choice for any room where you require near to total blackout. They are available in a wide range of colours and designs and can be fully or partially closed to any position. The loft, when converted, is likely to be the sunniest room in the house, so blinds are essential for keeping the room dark and peaceful when you want it to be. For spaces that are meant to be slept in, blackout blinds are a great way to go as they eliminate all light. The blackout blinds featured in the video (right) are solar powered are installed into two a double Cabrio Balcony. During the installation, the blinds were programed to be controlled via a single remote and therefore work in-sync. I'm really happy you completed the job on schedule and on budget as you said you would, and it was a genuine pleasure to meet all of you on the team. Thank you for being such a first class company to do business with, and for always communicating so promptly and so well throughout the process which I think we both value highly. I could not have asked for more, and am a very satisfied customer. I know which blinds I want. I'm looking for inspiration and would like a catalogue.